Prince William is spending the latter half of his four-day stay in Japan, starting Saturday, in the country's tsunami-ravaged northeast, a visit certain to draw global attention to the stories of survival and continuing suffering in the region. The March 2011 earthquake and tsunami, which killed nearly 19,000 people, left swaths of the northeastern Japanese coastline destroyed. Four years later, tens of thousands of people are still living in temporary housing. Adding to the hardship is a nuclear catastrophe that has created a no-go zone around the Fukushima atomic plant. During his stay in Tokyo, which began Thursday, William visited with the cast of a samurai TV show, performed a good-luck sake-barrel-breaking ceremony at a shopping mall and had tea with Japan's crown prince. He is scheduled to leave for China on Sunday. Memories of William's mother, who died in 1997, are everywhere. The media in Japan, a culture that traditionally values male heirs, have been referring to the prince as "Diana's first-born son," as though that was more important than his being second in line to the throne. After William on Friday laid a wreath at a grave for Commonwealth servicemen who died while held as prisoners of war in Japan, he signed a visitors' book. Next to the book was a framed photo of his mother laying a wreath at the same cemetery when she visited in 1995. Next to the picture were written the words: `'May she rest in peace." The master who performed the ancient art of tea ceremony for William in a Tokyo garden had done the same for Diana, and recalled how she loved the green tea. William's trip to Japan's tsunami-devastated northeastern region, relatively unusual for a visiting foreign dignitary, follows in the path of his mother's humanitarian efforts. 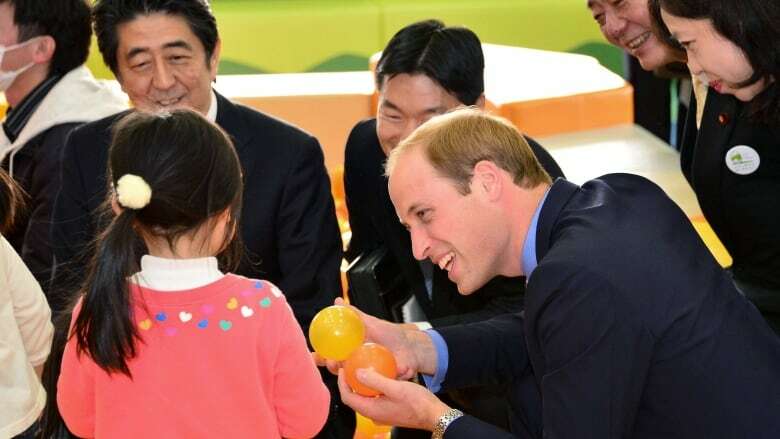 On Saturday, William visited with children in a playground in Fukushima, about 60 kilometres west of the meltdown-stricken nuclear reactors. The children were being allowed to play outdoors for the first time recently. Previously, radiation levels had been too high for children, who are more susceptible to the health risks of radiation. Children scurried around William. Japanese Prime Minister Shinzo Abe played host, and they all juggled balls at Smile Kids Park playground. Abe has been eager to spread the message that the nuclear disaster has been brought under control, although some say problems remain with contamination from radiation and continuing leaks at the reactors. Local growers and fishermen have complained of what is called "fuhyou" damage, which means caused by false rumors or gossip. Many people remain afraid of eating Fukushima-grown products. Nothing speaks of British greatness more than cars. And so shiny Aston Martin vehicles were on display for William's visit Saturday to a Tokyo shopping complex. Greeted by throngs of people, some shrieking "William!" he climbed into one of the cars alongside Aston Martin Chief Executive Andy Palmer and revved the engine into a loud roar. On Friday evening, at a banquet in honor of William at the British Embassy in Tokyo, a sumo wrestler "yokozuna," or grand champion, who ranks at the top of the traditional sport of burly fighters, arrived in style — in a Bentley. Never mind that Volkswagen AG of Germany owns Bentley. It's still an icon of British auto luxury. 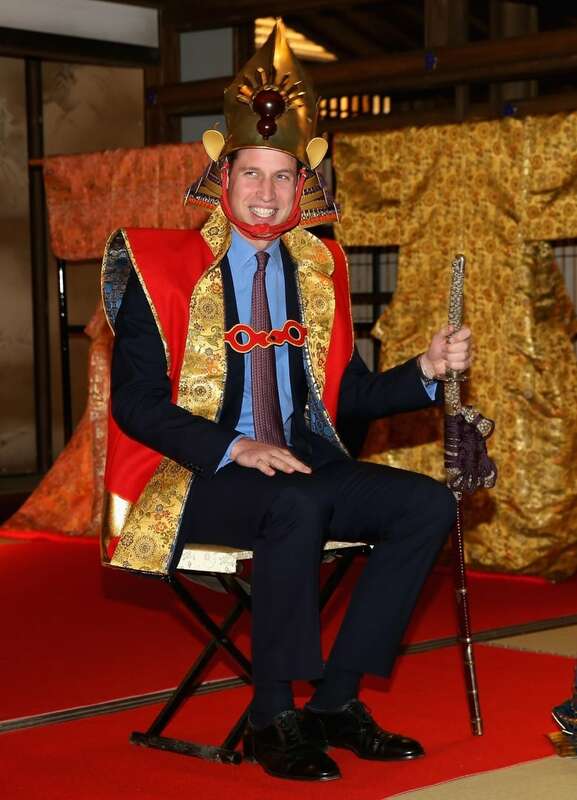 Also Saturday, William visited with the cast of a samurai drama show at Tokyo TV broadcaster NHK and tried on the glittering helmet and red kimono coat of a shogun samurai. He also watched three geisha actresses dance. "How do I look?" he asked after looking at himself in the mirror. "I feel ready for action." The day before, at another shopping complex in Tokyo, William acknowledged what he had aspired to be growing up: an astronaut, a policeman or a fire-breather. He is set to start his job as an air-ambulance pilot this summer. At NHK, William also watched, and was visibly moved by, footage shot by helicopters of the 2011 earthquake and tsunami that showed homes, roads and cars being swept by towering waters. He is scheduled to visit such spots Sunday, including a hilltop overlooking an area of total destruction.